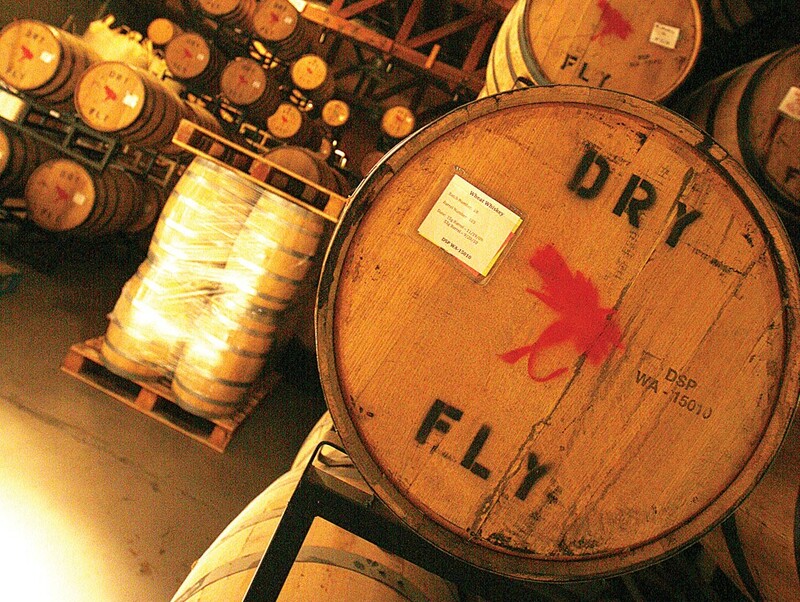 It's a hectic day in the operations room of Dry Fly Distilling. Under an electrocution-warning sign stamped in Russian Cyrillic, workers prepare grain to be fermented into whiskey. The distillery’s co-owner, Don Poffenroth, watches from the center of a room, standing on a floor about to be repainted and talking about how his prices will have to go up due to Initiative 1183. In November, Washington voters approved 1183, which will privatize the state’s liquor stores and add two new liquor taxes. Financed primarily by big-box retailers like Costco, Safeway and Trader Joe’s, 1183 was sold as a way to increase state revenue and choice for consumers. What the initiative’s supporters didn’t advertise was that the change might cut the selection of craft distillers’ products in stores, discourage new entrepreneurs, and increase liquor prices. That, however, is precisely what Poffenroth and others believe will happen when the private stores open their doors to liquor sales on June 1. Poffenroth, who looks like a softer, gentler Henry Rollins, talks as Bruce Springsteen’s “Glory Days” blares on the distillery floor. “By the time you take those collective new taxes, the fact that [retailers and distributors] need to make a profit to stay in business and add all those factors together, I don’t see there’s any way that liquor prices will go down,” Poffenroth says. Orlin Sorensen, co-owner of Woodinville Whiskey Company on the west side, says the law will increase prices for craft-distilled products. That’s because the new law adds both a distributor tax and a retail tax. “If [we] want to land on the shelf at $29.95, the state buys it from us for $14,” says Sorensen, whose company makes three types of whiskeys and a vodka. With the new taxes, if his company’s prices remain the same, “That $30 bottle becomes a $40 bottle,” Sorensen says. Sorensen says Woodinville hopes to cut a small amount of its wholesale price and convince whatever distributors and retailers that stock their product to cut their profit margin. He hopes that will mean a customer will only pay a few dollars extra. Poffenroth says Dry Fly will keep its prices the same and let the mark-ups occur. “We can’t afford to [cut the wholesale price] — we’d be out of business,” he says. But consumers can’t pay higher prices for products they can’t find. And by switching from well-stocked state stores to large retailers, the selection of Washington-made products may dwindle. Now, most liquor will be sold in stores with more than 10,000 square feet of retail space — big-box retailers, essentially. A state-run liquor store stocks 800 or 900 different varieties of liquor, says Chris Marr, a former state legislator from Spokane and a current member of the state Liquor Control Board. A big-box retailer, meanwhile, will stock fewer than 100 brands, Marr says. Over 200 varieties of vodka — including Dry Fly and Seattle-area brands Fremont Mischief and Ebb and Flow — are currently listed on the state Liquor Board’s product site. A website for some of Costco’s Texas stores, by contrast, offers eight varieties of vodka. The state stores previously acted as distributors, Poffenroth says. Private distributors that will fill that void will be less friendly toward craft distillers, he says. Craft distillers may have to change their business model in order to survive, like opening a brewpub or restaurant to sell their product, Marr says. Marr says the liquor control board hopes to remove other regulations, such as the current two-liter limit for buying liquor at the site of a craft distillery, but Poffenroth says he thinks that won’t make much of a difference. Ironically, Marr says, before 1183 passed, the state was “actually moving toward a separate section in our liquor stores” for state products. Representatives for Wal-Mart and Costco told The Inlander that they are open to working with local distillers to provide space for their products. But because big-box stores often have many special requirements for the products they stock, Poffenroth says he doesn’t know if he wants Dry Fly in stores like Costco. Steve Hill, co-owner of Hills’ restaurant in Spokane, doesn’t sell a huge amount of liquor. So when he needs bottles of vodka or rum, he faxes a state liquor store on North Division Street. “I tell them a joke, write them a check and I’m out of there,” Hill says. “Now I’m going to deal with how many different distributors? Am I going to have to call Wal-Mart and Safeway to see who has the best deal this week?” He also worries about the selection he’ll have. “Who’s going to carry Benedictine? Campari? Chartreuse? Things that I use three or four bottles a year of? That’s one of my concerns,” Hill says. “I’m not too excited to be the first bar to have Kirkland vodka on my bar,” he adds, referring to Costco’s private label brand.